Datingadvice.com wrote a review about us today. Check it out here! With over 12 million users worldwide and numerous advanced features, Mingle2.com is one of the largest all-inclusive free dating sites out there. From a comprehensive search system to premier, private browsing and messaging functions, finding that special someone is “totally free and always will be” thanks to Mingle2. According to Online Dating Magazine, there are more than 2,500 online dating sites in the United States, with 1,000 new ones launching every year. The good news is most of those sites are free or offer free trials. The bad news is they often cut users off at communication, which is arguably the most important part of online dating. 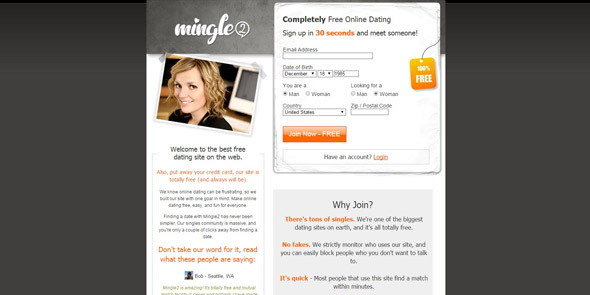 Mingle2.com is one of the largest free dating sites. Mingle2 provides millions of singles with an easy, fun, and well-rounded online dating experience — all at no cost. Jean Liang, President of Minglenet (the parent company of Mingle2), was kind enough to give us the lowdown on Mingle2’s free premium features and vast user base, as well as why it was important to create a 100% free dating site that will stay that way. “We believe that there’s nothing more important in life than love and the joy of connecting with others, and Mingle2 wants to provide a fun, easy, and free environment to bring more joy to people’s lives,” Jean said. Founded in 2006, Mingle2 has never been a typical free dating site. While a majority of sites let singles sign up and create a profile for free, Mingle2 lets them do that and so much more. Their business model allows them to offer all the vital features for finding a match – including viewing other profiles, sorting preferred users, and communicating with them — without a price tag. “We don’t think you should have to pay to meet somebody special, to meet the person of your dreams, to meet a date,” she said. Mingle2 offers more free services, including communication, than most other dating sites. And it’s that mindset that is leading Mingle2 toward the 13 million member mark within the next few months. Many dating sites have a lot of flashy features but a user base that leaves much to be desired, but Mingle2 has done a great job of expanding its offerings while building a community that’s just as vast. Users come from all over the world, particularly English-speaking places like the U.S., U.K., Australia, and Canada. And their ages range from 18 to 55+, with 60% being men and 40% being women. Ninety-nine percent of members use Mingle2 for free, and the site even offers an optional paid account for those who just can’t get enough features, including the ability to have their profile highlighted in search results or see if someone read their message. Advanced filter system lets you dictate who sends you interactions and messages. Stealth Mode hides when you’re online and browsing profiles. Block or flag users who are being abusive or inappropriate. Intuitive iPhone and Android apps make it simple to date anywhere and anytime. Mingle2’s active blog provides expert advice and tips on a regular basis. Thanks to the several features listed above and many more, singles on Mingle2 are able to adapt the online dating experience to their particular wants and needs, which can be especially handy for shy daters. 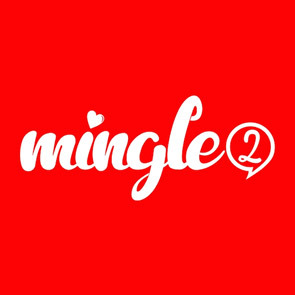 Mingle2’s features, including its app, allow singles to adapt the process to their dating needs. If you’re nervous about sending a message to someone you like, start off by sending them a friend request or flirty “hug” or “kiss.” You can also simply “like” someone who catches your eye. If you receive a “like” in return, then you’re automatically matched and the hard work is done for you. “We offer different ways of matching with a user without having a lot of roadblocks. If one doesn’t work for you, you can try another,” she said. Besides paving the way in terms of price (or lack thereof) and features, Mingle2 is also going above and beyond with its content. Soon they’ll launch an in-depth how-to guide that will help men and women understand each other more so they can online date better — and therefore offline date better. Mingle2 cares about helping singles find love without breaking the bank, as well as providing them with the necessary tools to do so — which is why the site is a leader in the free online dating space. They’re showing others that it really is possible to provide a fulfilling experience at no cost to the user. I am a loving man I like every type of men very clean I like to go outside .